We've all seen those riders out on the road. Their kit is perfectly coordinated, from their shoes to their gloves, somehow even having the perfect accent colors on their helmet and glasses. Thanks to the Louis Garneau Equipe line, you can too. 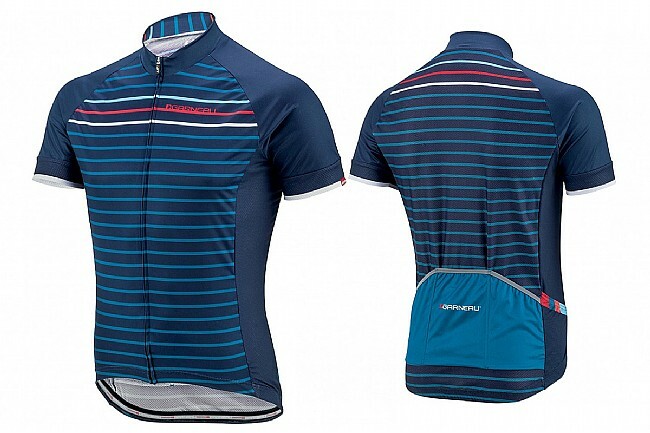 The Equipe Jersey sports a sleek, modern design that is complimented perfectly by the Equipe Bibshorts. The 2017 Equipe jersey now features a brand new blend of lightweight, breathable and moisture wicking fabrics. The semi-opaque structure of AirFit mesh allows cool, fresh air to pass through the jersey with ease, taking moisture with it. Zircon fabric throughout the jersey wicks away sweat and moisture to keep your core temperature regulated, even during the hardest efforts. Silicone gripper at rear hem. Powerband compressive closure at arms. Multimedia sweatproof pocket and additional Enviro pocket for garbage. Jersey is great . Gave it to someone who it fits.